Designed to satisfy the most rigorous demands of the professional musician - outstanding dependability! 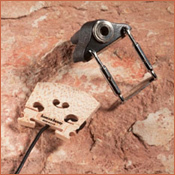 The piezo transducer is built right into the bridge, achieving wide-band frequency response, perfectly balanced string sensitivity, feedback rejection and excellent signal isolation. More pro violinists depend on the 1320 for unequalled acoustic-electric performance! Includes 3100P 1/4" output jack. Sensor has wideband frequency response, perfectly balanced string sensitivity, feedback rejection and excellent signal isolation. Provides superb acoustic performance together with unequaled acoustic-electric capability. The 1320 is preferred by pro violinists such as Dan Kelly (Alan Jackson), John Jeansonne (Rascal Flatts), Brendon Anthony (The Pat Green Band), Lisa Haley and Dan Hochhalter. Pickup/Transducer: Select quality unfitted replacement bridge which incorporates a factory installed piezo electric transducer. Output Jack: Barcus-Berry model 3100P: 1/4" female Carpenter output jack with separate U-shaped bottom bracket and 2 turn buckles. Preamp: Not included; not required.